There are good movies, there are bad movies, and there’s everything in between. But every now and then, you come across something that’s just plain dull... dull as dishwater. Time Walker is the perfect example of that. It’s the kind of movie where the pieces are all sort of there to make it interesting and entertaining but, unfortunately, it’s executed in such a dry and dreary manner that you’re likely to forget it as soon as you’ve seen it. The story involves a group of college students and their professor upon the discovery of an ancient mummy. After bringing it back to their lab, the mummy awakens, looking for a set of scattered and precious crystals. One by one, he hunts them all down, killing anyone who gets in the way. Now it’s up to the professor to figure out how to stop the mummy before it kills all of them. Time Walker stars Ben Murphy, who lacks any sort of onscreen energy, unlike many of his costars, which include Nina Axelrod, James Karen, Kevin Brophy, and Shari Belafonte. It also reunites Austin Stoker and Darwin Joston, from Assault on Precinct 13, for a couple of scenes and was directed by Tom Kennedy, a name that few are likely to recognize though, if you’ve been watching movie trailers over the last forty years, you simply could not have avoided his work. His advertising campaigns and trailers ranged from The Empire Strikes Back to Indiana Jones to Home Alone. This was his only directorial effort and it’s clear that the story was influenced by Close Encounters of the Third Kind, particularly in the final minutes. Richard Band’s score for the film, at least to my ears, is also reminiscent of another project: Christopher Young’s score for A Nightmare on Elm Street Part 2: Freddy’s Revenge. 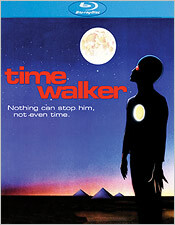 However, as Time Walker was released three years eariler, it’s unlikely that one influenced the other. It’s worth mentioning too that Time Walker was famously riffed by the folks at Mystery Science Theater 3000, where it was featured under the title of Being from Another Planet. For Scream Factory’s limited edition Blu-ray release (1,000 copies, to be exact), they’ve ported over their existing high definition master. It’s always been dark-looking on video, but now some of the finer details can be seen properly, allowing viewers to understand what’s going on a little bit better. The transfer features strong grain levels, but can be a bit splotchy in places. Though detailing is very good the film is a little on soft side, with built-in diffusion occurring during some of the daytime shots. Colors are good but skin tones tend to be inconsistent; most of the time they’re fine, but they dip into pink a little too often. Black levels are fairly deep, but shadow detail is lacking. Brightness and contrast levels are solid as well, and there appears to be no digital enhancements carried out. There are, however, leftover film artifacts on display, mainly speckling and some light scratches. It’s actually a very stable and fairly clean presentation otherwise. Given the previous standard definition presentation, it’s still an improvement in clarity. For the audio, you get a single English mono DTS-HD mix boosted to stereo. It’s a decent enough soundtrack, mostly centered as one might expect. There’s not much in terms of ambience or directionality, but dialogue is clean and clear, and both sound effects and score are reasonably strong. There’s also very light hiss. So it’s not a perfect audio presentation, but it’s still a strong one. There are subtitles in English for those who might need them. Scream Factory has also carried over the extras found on Shout!’s previous DVD release of the movie, which was their Vampires, Mummies, and Monsters Collection via their Roger Corman Cult Classics line. There are two separate interviews, including one with producer Dimitri Villard and the other with actor Kevin Brophy, as well as the film’s original theatrical trailer. I suppose including the MST3K version of the movie was off limits due to rights and budget constraints, but it would have been nice to have it as a supplement for posterity. Time Walker is certainly no masterpiece, but it still tries to function as one, a lot more than most bad movies usually do. It has some nice shots yet it lacks atmosphere, not to mention an interesting story, and characters worth caring about. Its anti-climactic ending certainly doesn’t do it any favors either. But fans of MST3K may find it interesting to see the film in its unedited form and judge it based upon its own merits. Scream Factory’s release of the movie on Blu-ray gives them the perfect opportunity to do so.